The year passed as a first draft, no rewrites just like life itself. Some parts are good when the juices flowed, some parts could have been better and some so bad you find it hard to recognise it as your own. But there is no re write. No Flaubert obsessing over Madame Bovary here. It was a year when the unthinkable came true. There was the excitement before Christmas at the launch of our new zinc explorer which emerged as Group Eleven Resources Corporation on the Canadian TSX-V. There was a sad damper on this achievement with the death of David Whitehead, a very valued member of our team. My sincere sympathy to his family. He will be sorely missed as a fine geologist and mentor but most of all as a kind man to those who had the privilege of knowing him. Who knows what the new year will bring. But we must get inspired and be passionate about what we do. I hope 2018 stimulates in us the childish awe of discovery in the ordinary. I wish you all health and enough, but not too much contentment When misty times come, may we have the strength to endure what comes our way. Remember always that a dead man can no longer risk and what we leave behind is what we gave away in this life. Blocks and chains may break our bones and bits of Tulip gossamer may turn f greedy fever to chilling fear. In metals, even the base may be in the ascendant and galvanise the precious. This year I will try to form habits instead of making resolutions – bit by bit rather than grand illusions. Now time to escape to Venice and across the river and into the trees on the winds of a dovefor a few days as Storm Dylan, the last of 2017, huffs and puffs and swirls into the Wild Atlantic Way. At this end of the year in the distended twilight, before the longer nights, it is a time for taking stock. But Spring is coming with brightening thaw. Cast a cold eye, on life on death, Horseman, pass-by – W B Yeats. Life is too important to be taken seriously – Oscar Wide. Group Eleven looks forward to a year of surprises! John Barry played a pivotal role in the unlocking of major gold deposits in Africa. The list of gold deposits includes Nyanzaga in Tanzania (1996) and Ahafo in Ghana (2000). He recognised the potential of Yanfoliala (Mali) in 2003. More recently in 2010 he led the team which the Mandiana gold project (Guinea). He has worked as an economic consulting geologist for 28 years. Over the past ten years he started and managed three successful public resource companies. John has seen a lot of mineralised rocks. John worked for respected international consultancies including CSA and Chlumsky Armbrust & Meyer . He is also a specialist in zinc-lead exploration. In 1992 he helped in the early delineation of Lisheen zinc-lead resource in Ireland. In 2008 he led the first outside group to secure a major zinc-lead project in southern Poland. The Upper Silesian zinc district is the the world’s largest MVT zinc-lead district . John (P.Geo and EurGeol) holds a Master’s Degree in Geology from Pennsylvania State University. 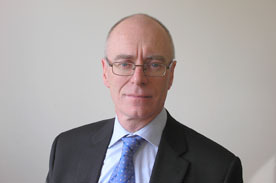 John has a MBA from the Edinburgh School of Business, Heriot-Watt University, Scotland. John is always open to new opportunities. Open to share his knowledge, insights, knowledge, strategic vision and extensive network of contacts. To help you discover and realise value in your projects. 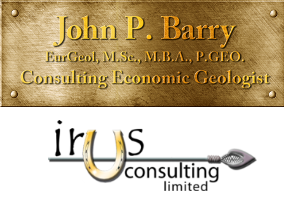 He is MD of his own Exploration Management and Geological Consultancy – Irus Consulting Ltd.
Click here to download John’s CV as a PDF. Click here to download John’s Statement of Qualifications as a PDF.